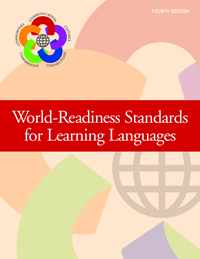 Alexandria, VA—The National Standards Collaborative Board is proud to announce the release of the newly-revised World-Readiness Standards for Learning Languages: Fourth Edition. The World-Readiness Standards for Learning Languages define the central role of world languages in the learning career of every student. The five goal areas of the Standards establish an inextricable link between communication and culture, which is applied in making connections and comparisons and in using this competence to be part of local and global communities. The Standards create a roadmap to guide learners to develop competence to communicate effectively and interact with cultural competence to participate in multilingual communities at home and around the world. First published in 1996 as the Standards for Foreign Language Learning, the World-Readiness Standards for Learning Languages represent an unprecedented consensus among educators, business leaders, government, and the community on the definition and role of language instruction in American education. In the nearly 20 years since release of the original standards, the document has been used by teachers, administrators, and curriculum developers at both state and local levels to improve foreign language education in our nation's schools and postsecondary institutions. In addition, they have provided the basis for national initiatives such as standards for teacher education programs, as well as for National Board Certification. The following language-specific standards documents are also available (as eBooks only) for purchase together with the World-Readiness Standards: American Sign Language (ASL), Arabic, Chinese, Classical Languages (Latin/Greek), French, German, Hindi, Italian, Japanese, Korean, Portuguese, Russian, Scandinavian Languages, and Spanish. The National Standards in Foreign Language Education Project is a collaborative effort of the American Association of Teachers of Arabic, American Association of Teachers of French, American Association of Teachers of German, American Association of Teachers of Italian, American Association of Teachers of Japanese, American Association of Teachers of Korean, American Association of Teachers of Modern Greek, American Association of Teachers of Spanish and Portuguese, American Classical League, American Council of Teachers of Russian, American Council on the Teaching of Foreign Languages, American Sign Language Teachers Association, Chinese Language Association of Secondary-Elementary Schools, Chinese Language Teachers Association, Modern Language Association, National Council of Less Commonly Taught Languages, and National Standards Task Force for Hindi. Read more information about the Standards and purchase.